In this latest in the Suspicion of . 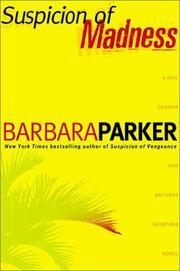 . . series, Parker (Suspicion of Madness, 2003, etc.) sends her protagonists to Cuba on a case that never quite kicks into gear. Headed to his native Havana for a reunion with his sister, Miami lawyer Anthony Quintana gets an unwelcome sendoff. Guillermo Navarro, a champion of Miami’s Cuban exiles, wants Quintana to persuade Quintana’s brother-in-law, Ramiro Vega, to defect to the US. Navarro claims Cuban Major Omar Cespedes, on the staff of Cuban General Abdel Garcia, indicated to the Ministry of Basic Industries in Brazil that Vega wants to defect. Quintana, convinced of Vega’s loyalty to Castro, remains skeptical as he and lawyer wife Gail Connor and their children arrive in Cuba. Their illegal passage becomes Navarro’s leverage: if Connor and Quintana fail to bring back Vega, they may be arrested and prosecuted for breaking the US embargo against travel to Cuba. Further standoffs and tensions ensue, but there’s little momentum as everyone circles everyone else. General Garcia warns Quintana that unless the lawyer tells him what information Cespedes passed to the Ministry in Brazil, Quintana, his wife, and his family will never leave Cuba. Anti-Castro revolutionary Mario Cabrera realizes Quintana’s daughter, whom he finds attractive, can get him to Vega, whom he wants to assassinate. Gail, meanwhile, who spends about half of the time just fretting, finally moves into action in a soap-operatic moment when she learns that 21-year-old Mario is the passion child of a long-ago affair Anthony had with a woman still living in Cuba. Can Gail forgive Anthony? The predictable kidnapping of Gail’s daughter Karen, the rubout of Major Cespedes, and a final shootout at Vega’s place, give her time to decide—though the marriage and the next case never seem threatened. For all the characters, details, and theatrics, a rather inert installment.